Lauren Fendrick: Recap from the 2009 season! Recap from the 2009 season! What a whirlwind of travel I had this past season! 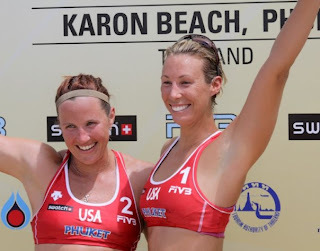 My partner, Ashley Ivy, and I were the fourth team to represent USA in international beach volleyball competitions on the FIVB World tour. We traveled to Brasil early in the year and then spent a total of six weeks traveling from Norway to Switzerland to Russia to France and finally to Austria. Later in the season we flew back to Spain, China, and Thailand. Our first big accomplishment was qualifying for the World Championships in Stavanger, Norway with only three FIVB tournament finishes (four finishes count). The international tour is quite different from the domestic tour. While almost all of the US players on the domestic tour only started playing beach volleyball in their twenties after completing illustrious indoor volleyball careers, the international players are groomed through youth and junior programs and become professional athletes at much younger ages. Additionally, most US players supplement their income with a second job, while most international teams are funded by their country and/or sponsors and are usually able to focus full-time on solely beach volleyball. That being said the US is still always among the best in the world. While Brasil is also consistently dominant, this year for the women the US team of April Ross and Jen Kessy were the World Champs. It was an honor and eye opening to compete against so many Olympians. While we did not fare so well at World Champs, which I blame on the rookie mistake of not arriving early enough and adjusting to the unusually deep sand, we were able to fly back to the states for a few days and compete in the AVP in Brooklyn, NY. There Ashley and I upset the #1 seed in the tournament and narrowly missed making the semifinals. We were back in the States for less than 72 hours, took a satisfying 5th place, and headed back overseas to compete in the international Grand Slams. Our next stepping stone was a ninth place finish in the Grand Slam in Klagenfurt, Austria. After advancing from a tough qualifier, we played really well in pool play and advanced to the playoffs where we upset the Norwegian team of Nila and Ingrid. The crowd in Austria was one of the most enthusiastic groups I've ever played in front of. From 9 a.m. on Wednesday until the finals on Sunday these people not only filled the stands in the stadium, but surrounded the outer courts as well. They were chanting, cheering, and just loving on the sport of beach volleyball. It was quite the breath of fresh air. Finally, we ended the FIVB season with a semi-final appearance in Phuket, Thailand. We lost in the first round, but fought our way through the contenders bracket to reach the bronze medal match. It was my best finish to date and a satisfying result to end the season. After this incredible season, I had the honor of being nominated for FIVB Rookie of the Year. I learned so much from this years experiences and I am excited to apply these skills to the upcoming 2010 season! Thank you to my coaches Corey Glave and Liz Masakayan, to my sponsor Vert Sports Therapy and Fitness, my trainer Erich Nall, and my partner Ashley Ivy for a successful season.